If you always thought the high prices you pay at the pumps were down to the high markup added on by the greedy petrol stations you might be surprised to learn that in fact the retailers’ slice of the price of petrol is the smallest of all. Changes in the oil industry have significant effects all around the world. Crude oil (which is refined to form petrol) is the world’s most actively traded commodity and in 2005 the price of crude oil rose to prices which hadn’t been seen since the 1970’s oil crisis. In more recent years, an oversupply of oil has led to falling prices. This fuel escalator forced prices up from one of the lowest in Europe to now one of the most expensive. When it was first added, fuel prices rose by 3 pence a litre and tax contributed to 72.8% of the total cost. By 1997 the escalator had added 11.1p to the cost of unleaded petrol and was at 75%. It didn’t get any better when the conservatives left office and Gordon Brown took over, as the escalator increased and 3 pence was added per litre. This took tax up to an incredible 81.5% of the total price of fuel. 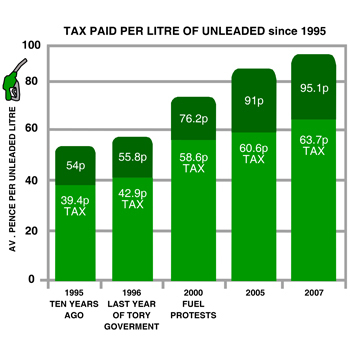 Despite the fuel escalator being abandoned in 1999, fuel prices did continue to rise rapidly, with a 2 pence a litre rise after the 2000 budget, contributing to the fuel protest. These rises were however argued by the government to be as a result of increasing oil costs rather than tax increases. This argument does hold some truth when we look at the graph above, showing that although the overall price of fuel has risen, the percentage of tax has stayed relatively constant and even dropped slightly this year. In April 2005, tax on petrol and diesel were charged at 47.1 pence a litre which with VAT added also, the total taxation makes up a huge 69.9% of the price we paid for unleaded and 67.3% for diesel. British drivers pay two taxes on petrol they buy at the pump and fuel campaigners complain about the fact that VAT is charged on the cost of fuel and the duty and feel it should only be calculated on the cost of the fuel for a fairer petrol price. Duty on fuel in the UK increased again on 1 October 2007, with an increase of 2.00 pence a litre on unleaded and diesel and an even greater increase on LPG and natural gas. Here you can find the fuel tax figures and, or budgets from 2007 up until this year. As of 1st October 2007, effective rates of duty for non-road fuels increased by 2 ppl. These rates are set to be increased by the same percentage as the main road fuels on 1 April 2008 and again on 1 April 2009. From 1 October 2007 duty rates for unleaded petrol, leaded petrol, aviation gasoline and other heavy oil used as road fuel were increased by the same percentage as the main road fuels. 13.70 pence per kg for natural gas used as road fuel. On 1 December 2008, a permanent 2p increase in fuel tax was introduced to offset the rate cut in VAT from 17.5% to 15% bringing the duty rate for the main road fuels up to 52.35p per litre. On 1 April 2009, the duty rate for unleaded petrol and diesel was increased by 1.84ppl to 54.19p per litre and again on 1 September 2009 by 2ppl to reach the level of 56.19 per litre. These rates were planned to be increased further on 1 April 2010 to 2013 by 1ppl above indexation each year. On the 1st January 2010, the VAT rate reverted to 17.5%. The 3p fuel duty rise scheduled for early 2010 was delayed in 2010 Budget with the duty going up by only 1p per litre on the 1st of April. This went up by another 1p a litre on the 1st October 2010 and was scheduled to go up by 0.76p on the 1st January 2011. A 0.76p increase on the 1st January 2011 brought the duty rate for the main road fuels up to 58.95p per litre. This coincided with the 2.5% increase in VAT rate, which was at a record high of 20%. No change to existing plans on fuel duty – a 3.02p per litre increase went ahead on 1st September. Vehicle excise duty rose by inflation but was frozen for road hauliers. An existing fair fuel stabiliser meant that above-inflation rises in fuel duty only returned if the price of oil fell below £45 ($70) a barrel. September’s 3p fuel duty rise was scrapped with no other changes. No change on fuel duty, it remained frozen for the year. No change on fuel duty, it will remain frozen for the year. The price of fuel is one of the most emotive subjects in British society and almost ranks alongside the weather as one of the most talked about issues. The single most significant cause of the UK having the 7th highest fuel price globally is because of taxation, both regarding specific duties initially imposed on fuel to discourage driving and reduce pollution, as well as Value Added Tax. Fuel duty has become a significant source of income for the UK government, and this is not going to change any time soon while the economy is still undergoing a period of austerity. What is perhaps revealing is that the fuel retailers themselves make very little profit selling fuel, this would explain why they have not been able to pass on savings from the cost of the crude oil directly onto consumers at the pumps as easily as people expect them to.